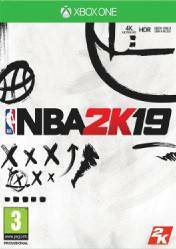 Attention: The price comparison of the NBA 2K19 game for Xbox One compares the standard version and the "20th anniversary" version which includes a lot of bonuses and extras for the game. Next to each price will be indicated this latest version and you can also select it from the filters button. The 20th anniversary edition of NBA 2K19 includes: 100,000 Virtual currency credits, 50,000 MyTEAM points, along with 20 MyTEAM League Packs (delivered one per week), which will allow us to build our perfect fantasy team. Plus, it also includes a Sapphire LeBron card guaranteed and more. Remember that digital games for consoles can have regional blocking, so make sure you can activate the game from your location. Remember also, that there are several formats within the digital versions, either in key format or in account format. Each format has different activation modes, so we recommend that you read the instructions in each of the stores. There are no comments yet about NBA 2K19. You can be the first one! FIRST EVER YOUTUBE LOGO 99 OVERALL PLAYSHARP GAMEPLAY ON NBA2K19! DEMIGOD!